Higher demands are made on materials of cooling plates for blast-furnaces, because they fail ahead of time being exposed to considerable thermal and mechanical loadings. New technical specifications and design of "light-weight plates" have been developed, fully taking into account the strength and thermotechnical characteristics of the material they are made of - nodular cast iron, and the process of casting such plates with refractory lining elements has been implemented. In the work they have investigated the wear resistance of gray cast iron and cast irons with different shapes of graphite inclusions depending on the mode of nitrogen ions implantation. They have come to a valid conclusion: the mode of implantation with a dose of 5·1017 ion/cm2 gray iron and vermicular graphite iron provide the highest wear resistance under the test conditions. For nodular iron the best results are achieved at implantation with a dose of 2·1017 ion/cm2. The article discusses the mechanism of the graphitizing effect of silicon-containing inoculants, practical ways of its enhancement have been outlined. This can be achieved both by optimizing the chemical and fractional composition of inoculating additives and by methods of their adding to the liquid iron melt. Enhanced friction-wear and vibration-absorbing properties were investigated by varying the chemical composition of cast iron, in particular, by varying the sulfur content at a constant manganese concentration. Positive results have been attained. For the purpose of making containers for transporting and storing spent nuclear fuel and radioactive waste, work has been carried out to create and select reliable and durable structures and material. The experiments conducted allow recommending a three-layer composite Nodular Iron + Stone Casting + Nodular Iron for utilizing the fission products of supertransuranic elements. The article gives a detailed analysis of the cost characteristics of sands. The composition of the least expensive - sodium silicate bonded - sand is given. Current reclamation costs have been emphasized. The analysis allows concluding that the purchase of reclamation units is obvious and topical. Along with the right selection of process-related factors and properly designed gating system, it is very important in the design of a V-process machine to have a system for monitoring and automatic adjustment of vacuum in the evacuated mold during the entire casting production cycle, which will allow minimizing the probability of rejects caused by gas inclusions and metal penetration. The article is dedicated to the problem of making and using materials for heavy-loaded hot working dies and die-casting dies. A method of making cast bimetallic steel-aluminum dies is described, and the results are analyzed. The investigations have shown that it is possible to improve the quality and thereby the working capacity of cast dies by forming a low-dispersion high-alloy layer on the working surfaces, to save scarce high-alloy steels and, in addition to that, the method allows separately utilizing the surface-alloyed steels and the back-up layer. A number of versatile melting facilities of different capacity have been developed. They can be used in technical re-equipment of foundries. Power supply systems are based on modern semiconductor frequency converters. They provide furnace power supply with medium and low frequency currents, and make it possible to re-distribute the capacities. 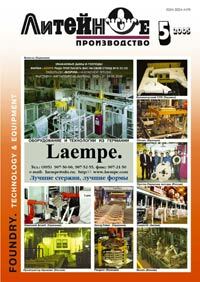 A High-Performance Melting Unit for RUP "Minsk Automobile Plant"